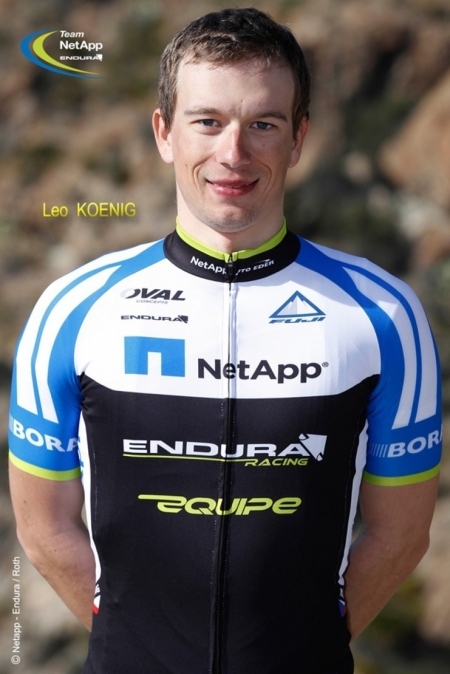 Leopold Konig (NetApp-Endura) won stage 7 of the Amgen Tour of California on Saturday, as Tejay van Garderen (BMC Racing) kept his GC lead and sealed the overall victory with one day left. The 146.5-kilometer course featured three categorized climbs, the big one being the brutal Mount Diablo at the finish. The 18.3km ascent averaged 5.8 percent, with the final 150 meters pitching up to 16 percent. Crossing the line second was Janier Acevedo (Jamis-Hagens Berman), while van Garderen placed third. Van Garderen holds a 1:47 lead over Michael Rogers (Saxo-Tinkoff) and a 3:26 advantage over Acevedo in the GC standings. Neither rider will attack van Garderen’s cushion on Sunday so all he needs to do is finish the stage to officially earn the first big victory of his career. BMC put on a climbing (and teamwork) clinic on Diablo, keeping the pace steady at the front of the peloton. Van Garderen was tucked safely behind his teammates for most of the way, out of trouble and in their slipstreams. As riders attacked left and right, BMC never panicked. In the final few hundred meters when the gradient kicked up, van Garderen kept up his cadence and rode strongly across the finish line. Konig was impressed with how BMC performed. A 10-rider break rode at the front of the race for much of the day, a group that included Andy Schleck (RadioShack-Leopard). At the base of the Diablo climb, however, the gap between the peloton and the race leaders was falling rapidly and the breakaway started to fracture. A number of riders attacked from the break and the peloton during the climb. David De la Cruz Melgarejo (NetApp-Endura) and Lieuwe Westra (Vacansoleil-DCM) eventually found themselves at the front of the race with 10km left, holding a lead of 1:05 ahead of the main field. At this point, there was a small chase group that included Schleck behind the leaders, a few solo riders behind them trying to bridge the gap, and the peloton. Some riders were already falling off the back as the road got steeper. Westra, who started the day more than 10 minutes behind van Garderen in the GC, eventually dropped off the front, as did Schleck. And then the attacks came in rapid succession. Jens Voigt (RadioShack) surged ahead of the main pack, and he was joined shortly after by Francisco Mancebo (5-Hour Energy). Voigt’s effort didn’t last long but Mancebo continued up the road and reached the front of the race. Voigt said the Diablo climb was difficult, but it did not live up to the expectations placed upon it leading up to the stage. With 3km left, Acevedo broke free from the peloton and quickly joined Mancebo in the lead. And then, seemingly out of nowhere, Konig surged up the road and beat everyone to the line. Sunday’s stage 8 is a 131.9km route from San Francisco to Santa Rosa.